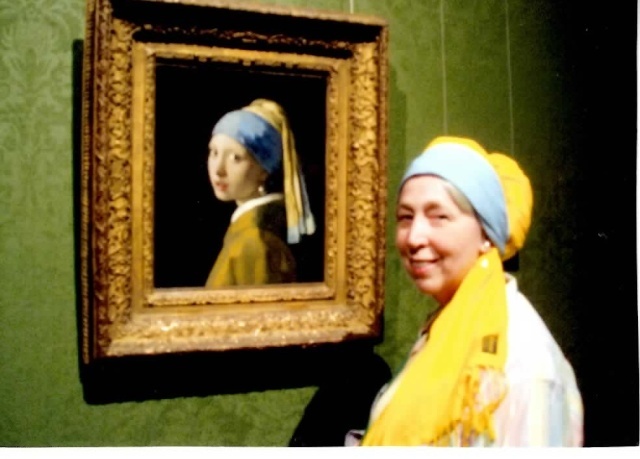 This is my sister in law the art teacher, who during a visit to Holland hatched a plan. She joined a tour group and put on this outfit. Slipped under the ropes that kept the crowd back while her husband shot this photo (with an instamatic camera I think) She said the bells and whistles went off and security came and pulled her aside for some time. But no one took the camera away. Pretty neat! I didn't know the original was that small. Love the frame on it. So.... she just happened to have some yellow and blue scarves with her? I think she was with a group that was also touring catholic churches, or they had visited the churches themselves, so the women had scarves. Hers was yellow, and knowing her she asked a perfect stranger to let her borrow the blue one. I like your sister-in-laws moxie. Thanks for the laugh. Great sense of humor! Thank you for sharing! Brilliant. Obviously the Dutch have the same attitude to security as have the British. I wonder if she'd visit again wearing a larger earring. Some people are never satisfied. On second thoughts, no, she'll now be on CCTV. It reminds me of a visit Jackie and I made to Rome four years ago. The only thing I enjoyed was a visit to the Villa Borghese. I was allowed to photograph, and TOUCH a large painting by Titian. My painting hasn't improved though.